I love Ohio State fans. I really do. Just when I think it's July and there's nothing interesting to post about, they keep giving us gems like this. How do Ohioans celebrate the 4th of July? 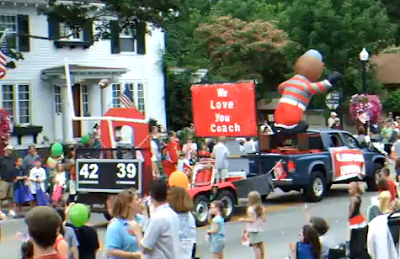 By creating a parade float celebrating Jim Tressel, of course. But my absolute favorite part of the " tribute" are the two riding lawn mowers at the end. You know, because what's a parade without rolling yard care equipment? Further proof that Jim Tressel, who essentially dug the grave for Ohio State's football program, can do no wrong in the eyes of Buckeye fans. I have a feeling that the reality of what he did wrong will finally set in once the NCAA delivers their verdict. But until then, now that everyone can agree to hate Pryor and praise Tressel, Jim's legacy as Sir Teflon will remain intact.